Marinated prime lean beef air dried and sliced with a strong chilli bite. Also available in 35g bags. 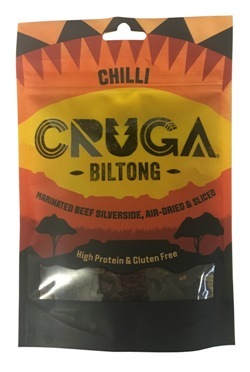 Cruga uses a unique blend of spices along with special drying techniques to make their authentic South African gourmet delicacy. Beef 200g per 100g of finished product, Spirit Vinegar, Sea Salt, Hydrolised Soy Protein, Caster Sugar, Spices, Yeast Extract, Garlic, Rice Flour, Paprika Extract. Preservative: Potassium Sorbate, Acidity Regulator: Citric Acid.